“At 6.00am on April 16th, 1964, the journey of the god began. The people of Coatlinchan watched this national treasure leave its centuries old home. In return, the village requested of the government a road, a school, a medical centre and electricity, all of which have since been received. “It was night when Tlaloc arrived in Mexico City; yet 25,000 people awaited him in the Zócalo. The city was prepared as if for a fiesta; lights were on everywhere, traffic was stopped and the streets were thronged. 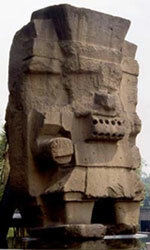 Ironically, the arrival of the rain god was greeted by the heaviest storm ever recorded for this ordinarily dry season ...” (Mexico: The National Museum of Anthropology - Pedro Ramírez Vázquez, 1968). As a teenager at the time, Graciela remembers the scene vividly! Hailed then as perhaps the most advanced museum in the world, the Anthropology Museum was opened 5 months later on September 17th 1964. Weighing 168 tons it’s reckoned to be the largest existing monolith in the Americas, though it was never finished by its stone carvers dating back to around the 5th century CE. 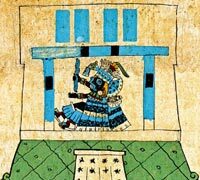 Tlaloc can be seen here shaking an ayauhchicahuaztli (‘stick for strengthening the mist’ in Náhuatl - ie a rainstick) at the clouds from his temple - from the Codex Borbonicus. • Press photos: can’t remember source!! • Image from the Codex Borbonicus (original in the Bibliotheque de l’Assembée Nationale, Paris); scanned with permission from our own copy of the ADEVA facsimile edition, Graz, Austria, 1974. My father, Joaquin Aldrete, grew up in the town of Huexotla which is a couple of miles from Coatlinchan. When he was a boy, he and his younger brother, Antonio, used to visit and play on the statue. He particularly remembers the first of these times (in 1941) when he and his brother would have been around 5-7 years old. A family friend took them to the site on horseback, and the way they were able to climb on top of Tlaloc was by jumping directly from the horse’s back. While sitting atop Tlaloc he recalls that they enjoyed eating a snack. He later visited the statue a number of other times including a camping trip when he was a member of the Mexican Boy Scouts around 1948. He remembers that the Tlaloc was completely surrounded by bushes and vegetation, just as in the photo, and was also covered with a good deal of graffiti where visitors had written their names on it. Mexicolore replies: Many thanks, Gregory, for this lovely anecdote. Well , i am really excited i found this information here on the net. I also visited Tlaloc when I was a little girl, I must have been 6 or 7 yrs old. I remember we went on a pic nic ,the whole family and it brought me nice memories about it. Its like going back to the past, travel to those beautiful days and i also remember when they brought it to the city there was a terrible storm here and everybody said “the gods are angry”thanks for making me remember so many things i never thought i would be able to live again. Mexicolore replies: Thank you very much for sharing these memories with us, Rosa. It’s strange that you should write this recently: just a few weeks ago, very sadly, Nigel Gallop - one of the two boys in the top photo! - died here in London. He was a good friend and inspirational person. We attended his memorial service on September 18th: it was deeply moving. He lent us the photo, from his father Rodney Gallop’s archive.